Earlier this week, my daughter and I hiked onto the Banks Peninsula from Birdlings Flat. The walk afforded us gorgeous views of Kaitorete Spit. Kaitorete Spit is only about 6000 years old, but is an important natural and cultural resource. Te Waihora / Lake Ellesmere, formed by the spit, is home to or visited by 166 species of birds and 43 species of fish which support commercial fisheries, recreational fishing and hunting, and traditional food gathering. 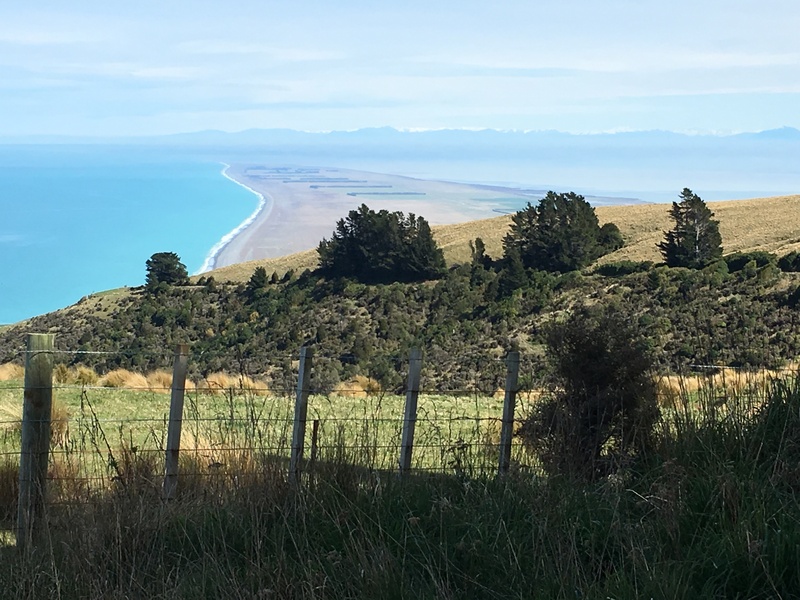 In spite of its harsh, exposed environment, Kaitorete Spit is home to a remarkable number of threatened plants and animals, including pīngao (a native sand sedge prized for weaving), a flightless moth, and the katipo spider. A variety of lizards also flourish on the spit. The lake and spit have been important sources of food and fibre for Māori since they arrived in the area. Fragments of the oldest known Māori cloak were uncovered on the spit, dating to around 1500 AD, and many other signs of early Maori use of the spit have also been found there. In pre-European times, Māori used the spit as a convenient highway as they travelled up and down the island. Unfortunately, the shifting gravel of the spit and the regular opening of the lake to the sea mean the spit isn’t passable in anything but the most capable of four-wheel drive vehicles. Today, travellers make the long trek all around the lake, so our home near the pointy end of the spit is a 40-minute drive from Birdlings Flat, just 25 km away on the fat end of the spit. But I’m happy to leave the spit to foot traffic—it helps protect the unique plants and animals that live there. On a windy, wet day, Kaitorete Spit is a miserable, exposed place to be, but visit it on a warm sunny day, and you’ll see why it is an overlooked gem.